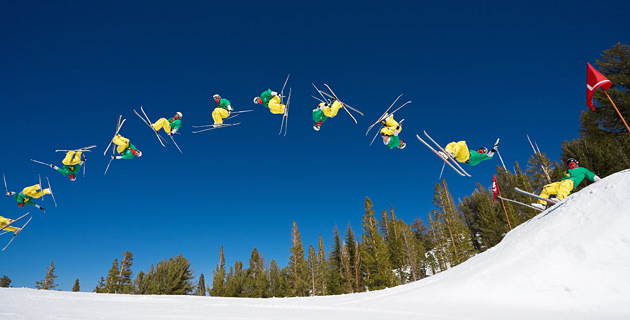 Anything that falls locally in a gravitational field, such as this skier, falls on a parabolic path (neglecting air resistance). Quadratic equations describe parabolas and allow us to analyse them. It is amazing how many processes and relationships in nature are related through quadratic equations. What is a quadratic equation (or expression)? It is a polynomial of order two. In simple language, this means that it may consist of up to three terms, a constant, a term consisting of the variable multiplied by a constant (e.g. 2x), and a term consisting of the variable squared multiplied by a constant (e.g. 5x²). All quadratic expressions contain the x² term (or else they would not be quadratic). They may or may not have the other two terms. If we set such an expression equal to a constant, or to another variable (such as y), we have a quadratic equation. For example, y = x² – 5x – 14, y = 2x² + 9x, x² + 4x = 12, or 3x² – 2x + 11 = 0. That’s it! Everything I share in this part of the website will be related to learning to manipulate quadratic expressions and understanding, solving, and graphing quadratic equations. If you already know how to multiply binomial expressions you will still be entertained with a rather silly mathematical pun. If you have not yet learned this skill, or never really understood it when you encountered it in school, I invite you to watch this video anyway. that you can appreciate a 'corny' mathematical joke as well! In this video I explain how to expand a binomial product (an algebraic skill) and then share a pun based on the process. [EXPAND How to Learn Pythagoras' Theorem] Apart from learning to find the areas of simple shapes, the first formula that students learn that connects algebra and geometry is Pythagoras' Theorem. It is a relatively simple formula but it has found profound applications in many branches of mathematics! For example, it connects our trigonometric rations and even allows us to calculate the exact length of a curve using calculus. There are many ways of proving this theorem! Elisha Scott Loomis identified at least 367 of them in his classic work, The Pythagorean Proposition, which he published in 1928 and again in 1940. The National Council of Teachers of Mathematics reproduced his 1940 edition in 1968. Even the 1968 edition is rare and highly sought after, so it is not cheap ... be warned! To master the understanding and use of Pythagoras' Theorem, I recommend that you learn its derivation and then practise deriving it at least once per day while you are solving problems using the formula. I recommend that you learn an algebraic proof and a geometric proof! In this video I demonstrate the algebraic proof that Chinese mathematicians used around 1100 BC. A similar proof by the incredible Indian mathematician Bhaskara II is worth studying (please follow the hyperlink and read about this amazing man), as is one by a former president of the United States of America, James Abram Garfield. I recommend that you visit the Scientific American blog about him, and read Angie Head's useful essay published on the University of Georgia's website. You will find quite a good rigorous geometric proof demonstrated and explained on YouTube on the mathematicsonline channel. You might consider exploring this channel (or even subscribing) as they have produced some extremely good videos and have produced a series of videos explaining Euclid's Elements, Book I.
I also recommend that you visit the Cut the Knot mathematics website. I only recently stumbled upon this most interesting site and the page discussing Pythagoras' Theorem is very comprehensive ... even bringing you up-to-date with material about Elisha Scott Loomis' book, The Pythagorean Proposition, as well! This is more than what I have expected! The summary idea is brilliant! Thank you very much! Definitely worth sharing!! !